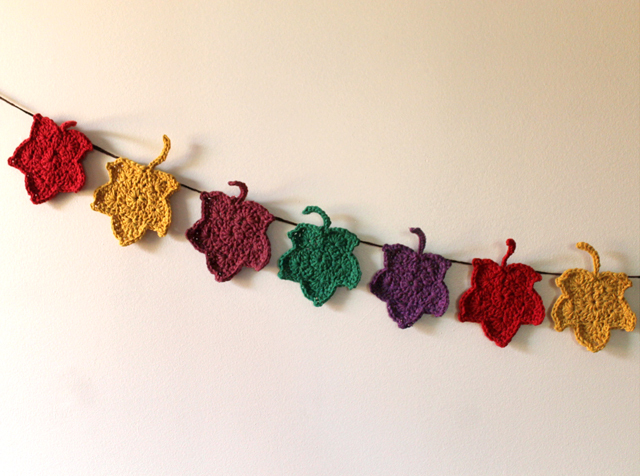 Thanks to this post on the blog called "Skip to My Lou", I found this free pattern for a crocheted maple leaf, created by Michelle over at "The Painted Hinge". 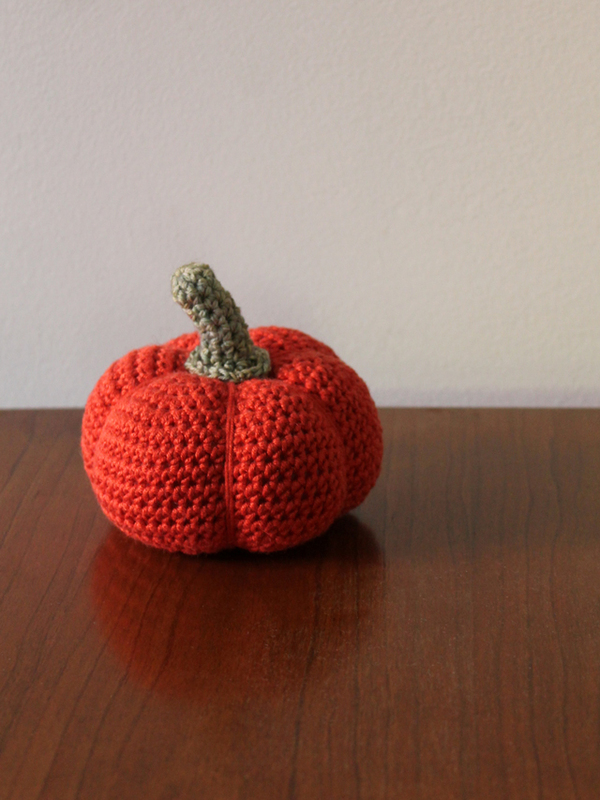 Apart from thinking that the leaves looked really good, I felt particularly compelled to make some because my pattern for a crocheted pumpkin was also linked in the same post, along with the statement that the leaves would go great with the pumpkin. So, who better to demonstrate how well the maple leaves and the pumpkin go together than me?! 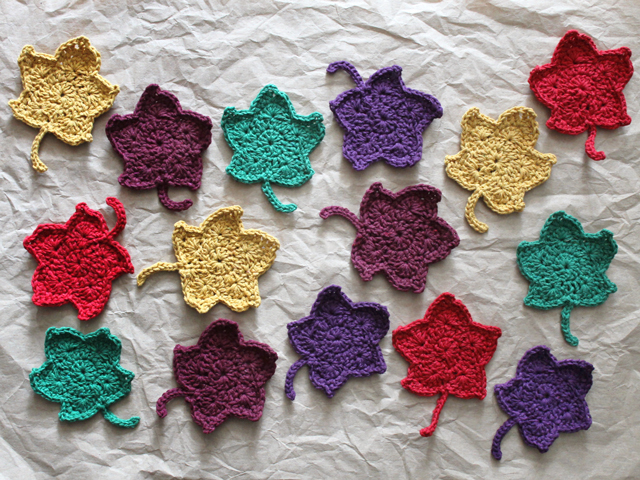 I had some cotton yarn in autumnal colours in my stash so I got busy, making 15 of the leaves -- three each of five different colours. 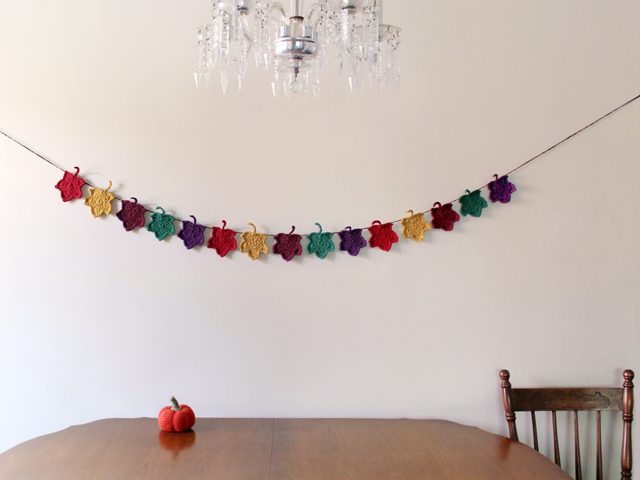 Then I strung them on some brown yarn and created a garland to decorate the wall in our kitchen. I love how the piece turned out, looking so bright and cheerful. 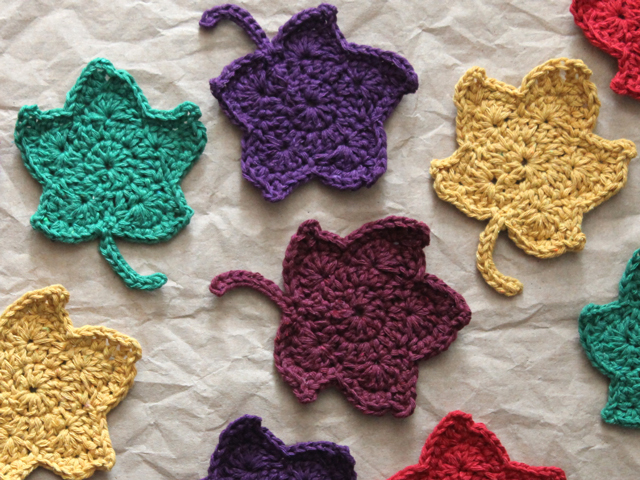 The leaves are pretty easy to make, with only three rounds of stitches each. I did have a bit of trouble with the counting at first, and I found the trick was making sure that, on the third row, your slip-stitches always line up directly into the slip-stitches in the previous row. I used a relatively small hook (4.0) for the yarn because I wanted the stitching to be tight. Also, I made the slight modification of replacing the triple-crochet stitches in the top point with doubles, and replacing the doubles on either side of the top point with half-doubles, again because I prefer a tighter more dense look. 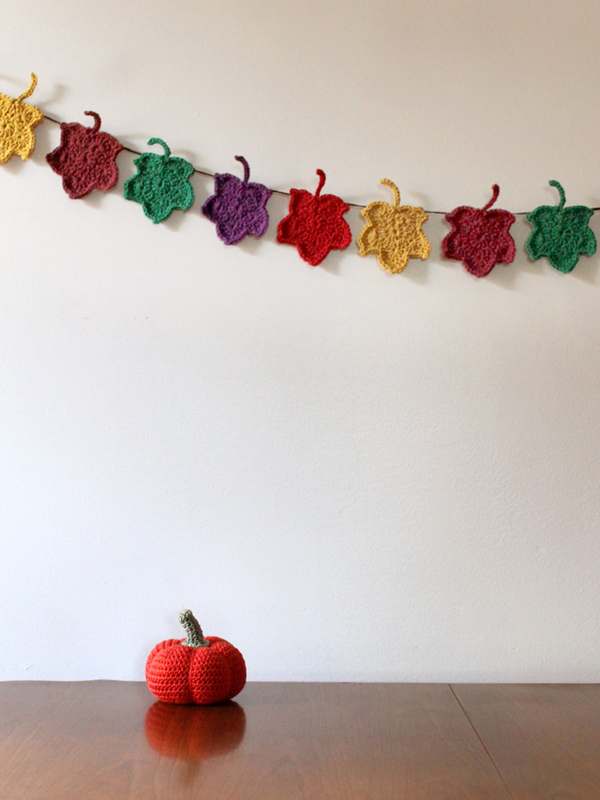 Of course, I had to display the garland with my pumpkin! You might recall that last year I made this garland using real maple leaves, that I pressed and then hung with twine -- it looked beautiful and I loved it, however, this year the maple leaves in Toronto are only beginning to fall now, at the very end of October. Considering that the Canadian Thanksgiving holiday was over three weeks ago, and Halloween is this weekend, repeating the natural maple leaf one, would have made no sense and resulted in a decoration that was just too late for the holidays I'd want it for. 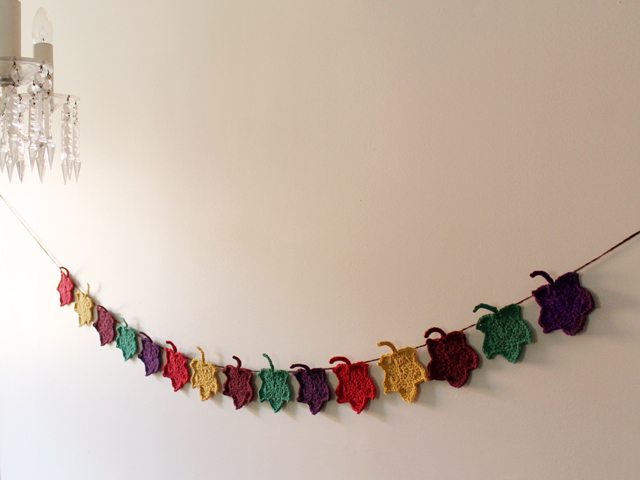 So, this yarn garland is a good alternative that will be ready to hang right at the beginning of the autumn season. That hasn't stopped me from pressing some real maple leaves though, and I got my first batch between some pages of an old magazine this morning. I plan to make some more of these bookmarks. Big thanks to Cindy at Skip to My Lou for linking to my pattern, and to Michelle at The Painted Hinge for the cute maple leaf pattern. And, of course, big thanks to you for checking out my post. This post was linked up at Nifty Thrifty Things, where it was selected to be featured! Beautifully crocheted, and perfect for every autumn day !! lovely. and i love the pumpkin.. so adorable! love this! 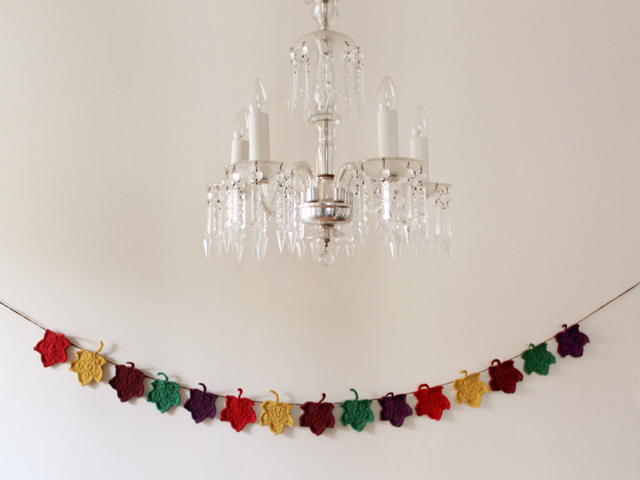 while I loved your pressed leaves garland, this is a nice option to have on hand for years like this one. So fantastic!